This is a light airy dough. It's perfect for hamburgers, hot dogs and sandwiches. It also freezes well, so make a double batch and keep some on hand for last minute barbeques or picnics. 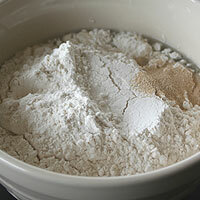 To make the poolish, combine flour, water and yeast. Using the paddle attachment, mix on medium speed 2 minutes. Cover and ferment 4-6 hours. To the poolish add the remaining ingredients. Using the paddle attachment, beat on medium speed 5 minutes. The last minute the dough should clean the sides of the bowl. Spray a medium bowl with cooking spray. Form the dough into a ball and place inside the prepared bowl. Lightly spray the top of the dough with cooking spray. Cover and rise 60-90 minutes or until double in size. 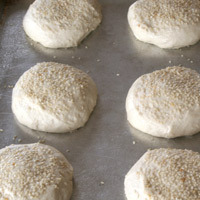 If air pockets rise to the surface while forming the buns, gently pop them. If you don't they can get very large and deflate the dough prior to or during baking. Spray a baking sheet with cooking spray and set aside. Lightly flour a work surface. Divide dough into 8 equal pieces. Form each into a loose ball by picking up one of the pieces and using both thumbs to push the dough almost through at the center. Bring the rest into the hole you have created and pinch the bottom. 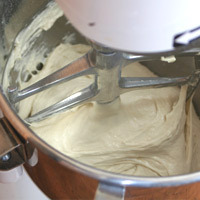 Continue to gently pinch the bottom to stretch the dough until it is smooth all the way around. Set aside. Repeat with the remaining pieces. Take the first piece you formed and flatten it into a disc about 1 inch tall. Set on prepared sheet. Repeat with the remaining pieces. Pop any large bubbles that emerge to the surface. Lightly spray a piece of plastic wrap and cover the pan. Rise 30-60 minutes until double in size. Heat oven to 400 at least 15 minutes before baking. Bake 20 minutes. Move to a cooling rack and cool completely. Slice and serve. Spray a baking sheet with cooking spray and set aside. Lightly flour a work surface. Divide dough into 8 equal pieces. Form each into a piece about 1 inch wide and 4 inches long. Picking up one of the pieces and use both thumbs to push the dough almost through in the middle. Bring the rest into the middle and pinch the bottom. 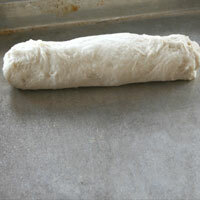 Continue to (3)gently pinch the bottom to stretch the dough until it is smooth all the way around. Set on prepared sheet. (4)Pop any large bubbles that emerge to the surface. Repeat with the remaining pieces. Lightly spray a piece of plastic wrap and cover the pan. Rise 30-60 minutes until double in size. Heat oven to 400 at least 15 minutes before baking. Bake 20 minutes. Move to a cooling rack and cool completely. Slice and serve. 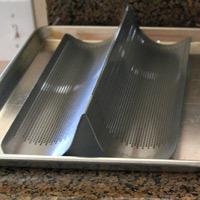 Spray a baking sheet with cooking spray or cover in parchment paper and set aside. Lightly flour a work surface. Gently remove dough from bowl. Lengthwise, fold the bottom third up and the top third down overlapping the bottom third. Using your thumbs press the new bottom fold down sealing it with the rest of the dough. Wrap the ends in and seal them to the bottom as well. Roll the dough so the seam is on the bottom and gently rock the dough back and forth starting from the middle stretching it to the desired length. Pinch the seam while doing this to have a tight and even skin. If there are large air pockets that rise to the surface gently pop them. 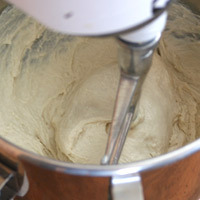 Place dough on prepared pan. There should be 2 or so inches of space on both ends of the pan. Cover the pan with two plastic grocery bags and rise 30-60 minutes until double in size. Heat oven to 400 at least 15 minutes before baking. Bake 20 minutes. Move to a cooling rack and cool completely. Slice and serve. 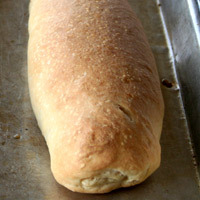 Set a french bread pan on a baking sheet. Lightly flour a work surface. Gently remove dough from bowl. Divide the dough into 2 equal pieces. Lengthwise, fold the bottom third up and the top third down overlapping the bottom third. Using your thumbs press the new bottom fold down sealing it with the rest of the dough. Wrap the ends in and seal them to the bottom as well. Roll the dough so the seam is on the bottom and gently rock the dough back and forth starting from the middle stretching it to the desired length. Pinch the seam while doing this to have a tight and even skin. If there are large air pockets that rise to the surface gently pop them. 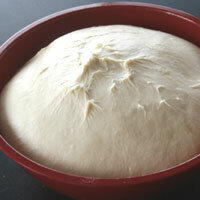 Place dough on french bread pan. There is no need to flour or spray the pan. There should be 2 or so inches of space on both ends of the pan. Repeat the process with the second piece. Cover the pan with two plastic grocery bags. Heat oven to 400 at least 15 minutes before baking. Position an oven rack to the second highest setting. Place a baking stone on the rack. 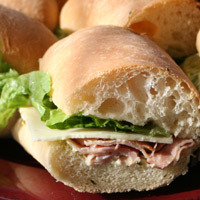 Place the french bread pan on the stone. Bake 20 minutes. Move to a cooling rack and cool completely. Slice and serve. To the poolish add the remaining ingredients. Using the paddle attachment, beat on medium speed 5 minutes. The last minute the dough should (1)clean the sides of the bowl. Spray a medium bowl with cooking spray. Form the dough into a ball and place inside the prepared bowl. Lightly spray the top of the dough with cooking spray. Cover and rise (2)60-90 minutes or until double in size. Spray a baking sheet with cooking spray and set aside. Lightly flour a work surface. Divide dough into 8 equal pieces. Form each into a (3)loose ball by picking up one of the pieces and using both thumbs to push the dough almost through at the center. Bring the rest into the hole you have created and pinch the bottom. 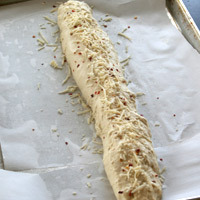 Continue to gently pinch the bottom to stretch the dough until it is smooth all the way around. Set aside. Repeat with the remaining pieces. Take the first piece you formed and flatten it into a disc about 1 inch high. Set on prepared sheet. Repeat with the remaining pieces. (4)Pop any large bubbles that emerge to the surface. Lightly spray a piece of plastic wrap and cover the pan. Rise 30-60 minutes until double in size. Heat oven to 400 at least 15 minutes before baking. Bake 20 minutes. Move to a cooling rack and cool completely. Slice and serve. Spray a baking sheet with cooking spray or cover in parchment and set aside. Lightly flour a work surface. 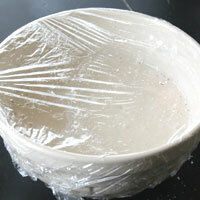 (3)Gently remove dough from bowl. Lengthwise, fold the bottom third up and the top third down overlapping the bottom third. Using your thumbs press the new bottom fold down sealing it with the rest of the dough. Wrap the ends in and seal them to the bottom as well. Roll the dough so the seam is on the bottom and gently rock the dough back and forth starting from the middle stretching it to the desired length. Pinch the seam while doing this to have a tight and even skin. If there are large air pockets that rise to the surface gently (4)pop them. 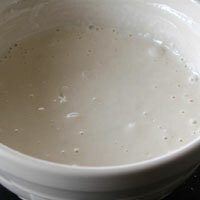 Place dough on prepared pan. There should be 2 or so inches of space on both ends of the pan. Cover the cookie sheet with two plastic grocery bags and rise 30-60 minutes until double in size. Heat oven to 400 at least 15 minutes before baking. Bake 20 minutes. Move to a cooling rack and cool completely. Slice and serve. Set a french bread pan on a baking sheet. Lightly flour a work surface. 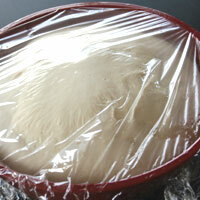 (3)Gently remove dough from bowl. Divide the dough into 2 equal pieces. Lengthwise, fold the bottom third up and the top third down overlapping the bottom third. Using your thumbs press the new bottom fold down sealing it with the rest of the dough. Wrap the ends in and seal them to the bottom as well. Roll the dough so the seam is on the bottom and gently rock the dough back and forth starting from the middle stretching it to the desired length. Pinch the seam while doing this to have a tight and even skin. If there are large air pockets that rise to the surface gently (4)pop them. Place dough on french bread pan. There is no need to flour or spray the pan. There should be 2 or so inches of space on both ends of the pan. Repeat the process with the second piece. Cover the cookie sheet with two plastic grocery bags. Heat oven to 400 at least 15 minutes before baking. Position an oven rack to the second highest setting. Place a baking stone on the rack. 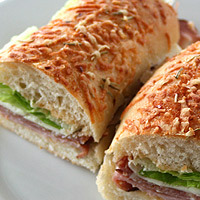 Place the french bread pan on the stone. Bake 20 minutes. Move to a cooling rack and cool completely. Slice and serve. 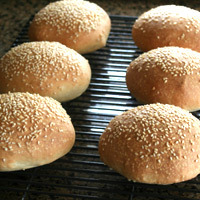 These buns are best when eaten the day they are made. As soon as they are cool, slice and store them. They dry out quickly. Place in a plastic bag or wrap well in plastic wrap. Freeze up to 4 months. 3. 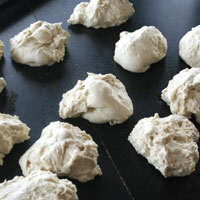 This is a soft dough and should be handled gently so the end result can be airy and light. It is important to form tem properly so when handling the dough do so gently but meaningfully. 4. If air pockets rise to the surface while forming the buns, gently pop them. If you don't they can get very large and deflate the dough prior to or during baking.